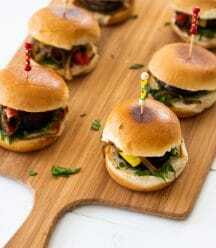 Portobello mushroom sliders are incredibly meaty and have a wonderful umami flavor. 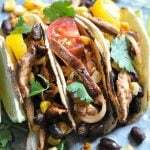 They’re easy to make and are the perfect alternative to meat. 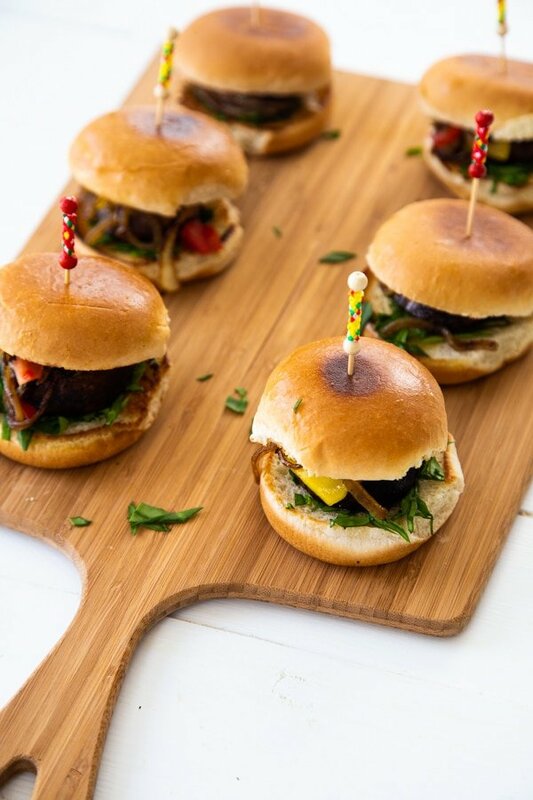 MUSHROOM SLIDERS THAT ARE EASY AND SO DELICIOUS! 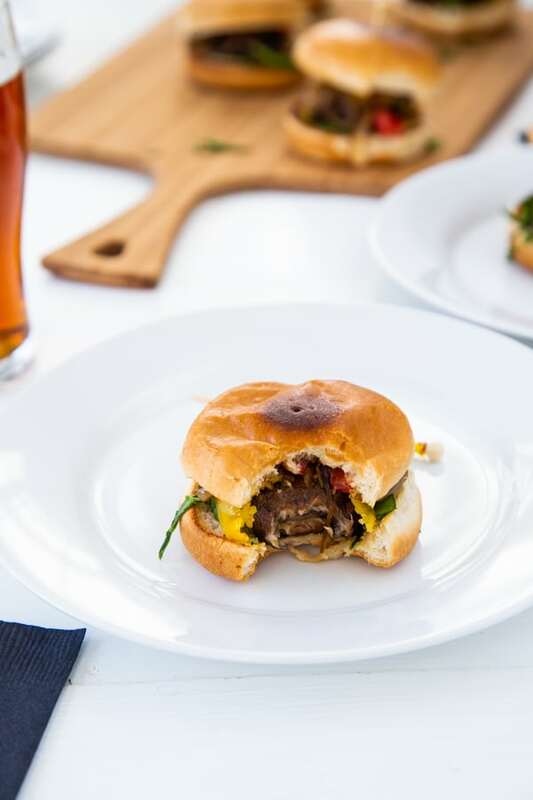 We love a good slider, and our favorite kind is made with meaty and flavorful portobello mushrooms. 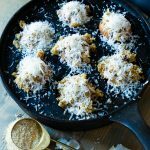 They’re the perfect meat alternative because they have a chewy texture and that amazing umami flavor. We like to use baby bellas for sliders because they’re just the right size for little slider buns. Although, you could use any kind of mushroom that is equivalent in size. 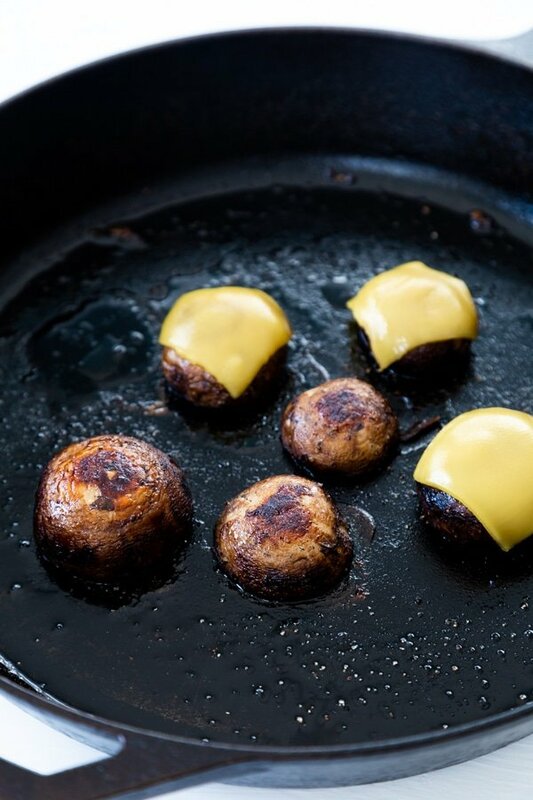 It’s so easy to saute or even roast mushroom caps, which is another reason that we opt for mushrooms when we’re making sliders. All you have to do is brush them clean, remove the stems, and let them sizzle in a tiny bit of olive oil until they’re perfectly tender, chewy, and delicious. WHY ARE MUSHROOMS GREAT FOR VEGETARIAN SLIDERS? They have a meaty texture. They have that meat like umami flavor. They’re a great source of copper, selenium, and vitamin B-6. They fit well on a slider bun. HOW DO YOU MAKE PORTOBELLO SLIDERS? The first thing you’ll want to do is brush the dirt off of the mushrooms with a soft brush or rinse them in cold water to get the dirt off. Then, remove the stems and heat the skillet that you’ll be cooking them in. Once the pan is hot, add the butter and oil and spread it evenly throughout the pan. 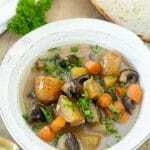 You don’t want puddles of oil or the mushrooms won’t cook evenly. Use a spatula to spread the oil. When the oil is hot,and the butter is bubbling add the mushrooms and cook for approximately 7 minutes per side, or until they’re tender and nicely browned. You can tell they’re done if you lightly press on them and they give to the pressure. You don’t want them to be too firm. Add the cheese and cover the pan so it melts over the mushrooms. This should take a minute or two. This is the pan we use to sear the mushrooms. Click the photo to learn more. HOW DO YOU SHOP FOR MUSHROOMS? Don’t buy mushrooms that are pre-packed if you can help it. It’s hard to know what’s in the bottom of the carton, and, if they’re covered in plastic, you can’t smell them. 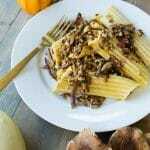 Choose firm mushrooms that have their stems. 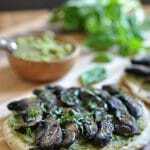 Bypass mushrooms that have wrinkled and dried out skin, black spots, or feel spongy or slimy. If they smell fishy or sour, let them be. Mushrooms have an earthy sent, anything other than that isn’t good. We’ve found that the best way to keep mushrooms fresh for as long as possible is to store them in the refrigerator in a container that allows them to breathe. If you cover them they start to rot much faster. Mushrooms that are purchased at their peak will usually last about 3 days in the refrigerator. WHAT KINDS OF TOPPINGS SHOULD YOU PUT ON A SLIDER? Our favorite toppings would be melted cheese, fried onions, fresh chopped greens, diced tomatoes, and a drizzle of balsamic vinegar. You do you! Whatever you put on your favorite burger can go on a slider. Here’s a list of ideas for you. 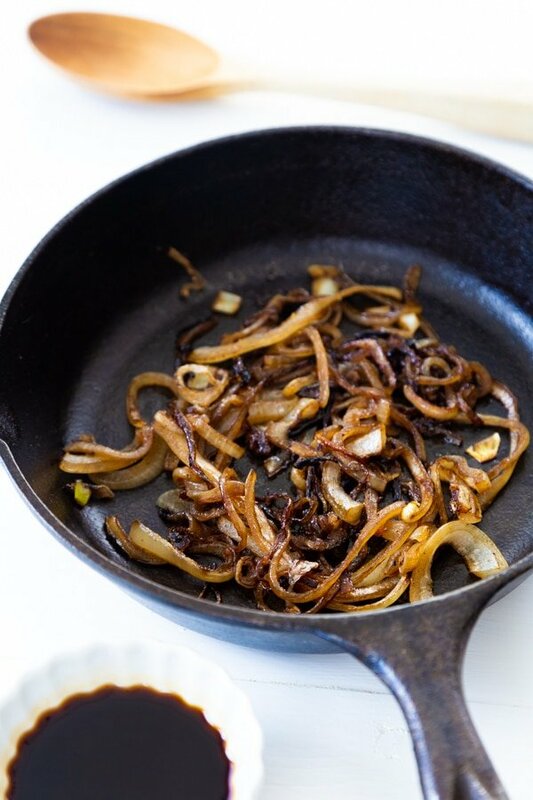 HOW DO YOU FRY ONIONS? Heat a heavy skillet on medium-high heat. Add enough oil to lightly cover the entire bottom of the pan. When the oil is hot, add the onions and stir them so they are evenly spread out in the pan. They shouldn’t be piled up or they’ll just steam. Turn the heat down to medium-low and stir frequently so they brown evenly. Cook for approximately 10 to 15 minutes, or until they’re nicely browned and the edges are beginning to crisp up. Add salt and pepper to taste. WHAT KIND OF BUNS SHOULD YOU USE FOR SLIDERS? You can buy slider buns in the grocery store (check the ingredients for milk and eggs), or you can make our Homemade Biscuits. If you need gluten-free buns, try Schar Ciabatta Rolls. To add more flavor and texture to the mushroom sandwich, we suggest lightly brushing the buns with vegan butter and toasting them. They’ll taste amazing and get a nice crispy texture. Prep the mushrooms and veggies on this cute board and then wash it and use it to serve the sliders. 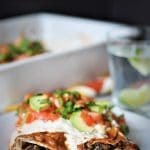 WHAT CAN I SUBSTITUTE FOR MUSHROOMS? Feel free to substitute any of the following vegan burger recipes, just make the patties small enough to fit in the slider buns. They’re small, so they’re definitely considered an appetizer. You can whip them up quickly. 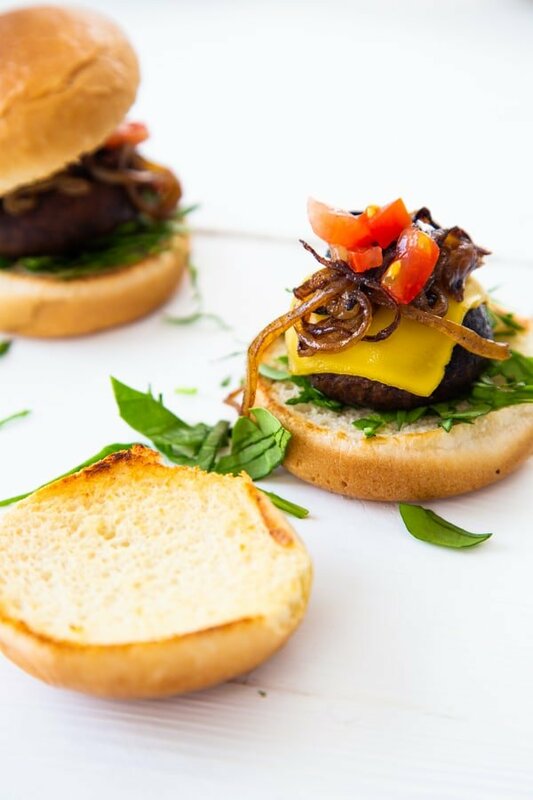 Mini mushroom burgers with all the toppings are going to be liked by almost everyone. Even though they’re small, they’re hearty enough to satisfy your hungriest guests. It’s easy to make a bunch of them and keep them warm in the oven so you can bring more out as needed. Make these and let us know what you think. We love to hear from you! And, don’t forget to take a picture of your gorgeous creation and tag us @veganosity on Instagram. 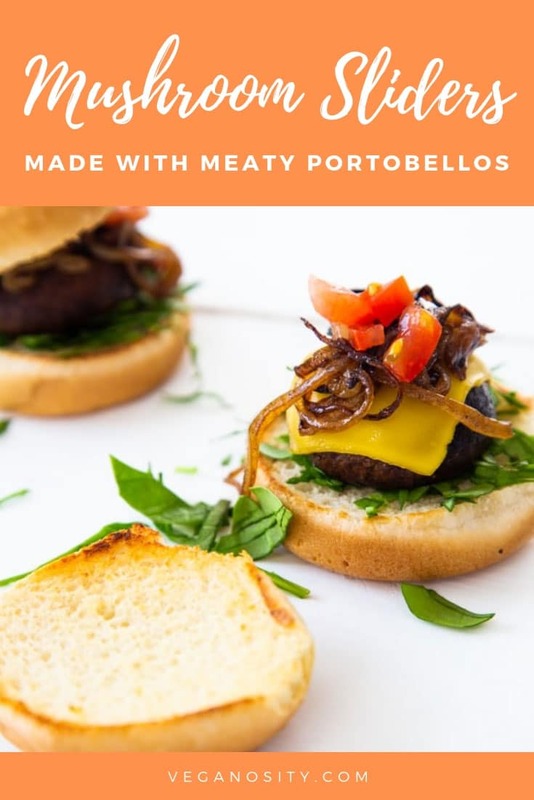 Easy, meaty, and delicious Portobello mushroom sliders that you can top with vegan cheese, fried onion, and anything you can think of. Perfect for a party! Heat the butter and oil in a medium sauté pan on medium high heat. When the butter and oil is hot and bubbly use a spatula and spread evenly in the pan, add the mushrooms. Sprinkle the Italian seasoning and salt and pepper on the mushrooms and cook for approximately 5 to 7 minutes then flip them over. Cook for another 5 to 7 minutes or until the mushrooms are soft (not mushy) to the touch. If you’re adding vegan cheese, put a slice on top of each mushroom and cook until it melts. You might want to put a cover over the pan to speed up the process. 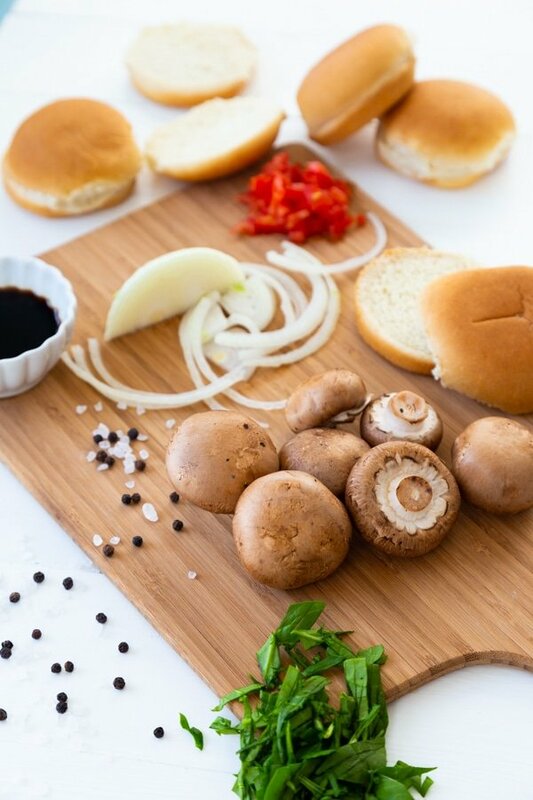 Put a mushroom on a bun and top with your favorite topping.